CHICAGO — Some of the best things in life are still for free, like a full rendition of Rachmaninoff’s Piano Concerto No. 3 by the Grant Park Orchestra, at Frank Gehry’s iconic Pritzker Pavilion. Welcome to Chicago, where winter is characteristically brutish, and summer’s infinitely rewarding, particularly to those who endured it’s yearly cold blast. Last Saturday was one of those hard-earned and much-deserved days of recreation. The sun was up and the afternoon air cool, just perfect to cap the official end of spring, and hail the beginning of summer, which was almost thwarted by a fierce thunderstorm the night before. It was unthinkable to stay indoors. Everyone was out, from die-hard Cubs fans who congregated at Wrigley to the Boriqueños for the Puerto Rican Day parade. And so we packed our picnic bag, took the “L” train and headed downtown. Unlike many cosmopolitan areas, this city of three million people, puts premium on its public space. Parks are sacred grounds, and malls are anathema. So while Chicago boasts of a magnificent skyline, it also has an excellent and expansive greens that the whole population can enjoy. It was the industrialist Montgomery Ward who first led the fight to keep the lakefront free from obstruction. And so it has been since 1836. At the heart of it all is Millennium Park, an over-priced but ultimately priceless piece of real estate that’s becoming a draw to both locals and tourists. Situated right next to Lake Michigan, it is home to Anish Kapoor’s Cloud Gate, a.k.a The Bean, a sculpture that has managed to capture the hearts of the art cognoscenti and the masses alike. It’s interactive nature is sure to make even an adult feel like a kid again. A week ago the infinitely youthful Ellen Degeneres even made a stop there, putting a stamp of approval to it’s must-see status. The Crown Fountain by Catalan artist Jaume Plensa is also another hit. It’s almost entertaining enough to just sit and people-watch. And if you have a camera, practice your lessons in apperture and shutter speed. 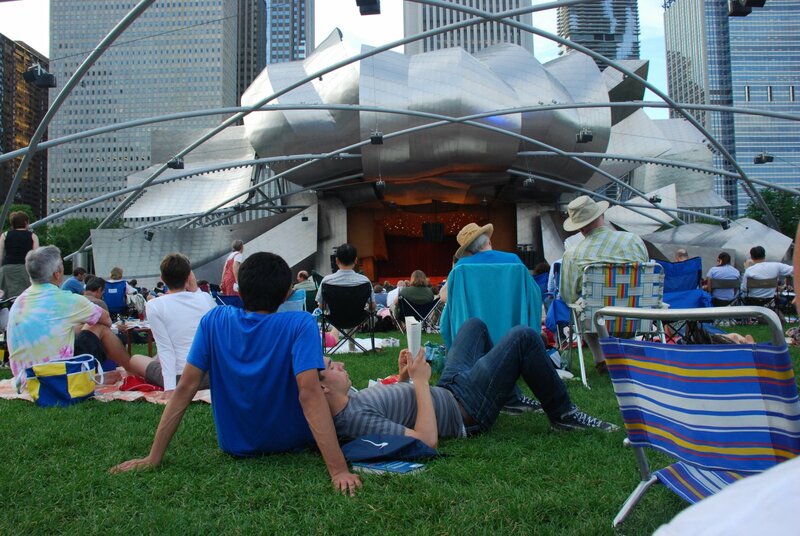 was being played at the Jay Pritzker Pavilion, a masterpiece by the world-renowed Gehry that opened in 2004. Echoing the sound of Rachmaninoff’s concerto, the Pritzker Pavilion soars into the sky like an undulating clouds of steel. Every Chicagoan who has been there can attest to its massive size and its exclamatory impact. The open-air music shell is further enhanced by a trellis-like network that encompasses the Great Lawn, and carries the high-tech sound system, which makes it possible for the entire audience to hear the same quality “indoor” sound as those seated in the front row. We found ourselves in the middle of the lawn, in the sea of wine-sipping, biscuit-munching concert-goers. Our picnic mat was half too small for four people, my mom included. But we still managed to leave enough space to spread our own nourishment. All that was left to do was to listen to the music. I’ve been to a few of these concerts before, and they never grow old. I’m not even schooled enough in the classics. All I know is that it’s soothing to the ears. It took a little convincing for some of my folks to come along with me. Now they are already planning for the next picnic. principal conductor’s role. But the music he created with the 100-people strong orchestra and Christopher Bell’s Grant Park Chorus surely made an impression on them. This year marks the twelveth time that Kalmar appeared on stage at the festival, and his tenth as principal conductor. A native of Montivideo, Uruguay, Kalmar also led the Hamburg Symphony Orchestra and Stuttgart Philharmonic. Concert pianist Jon Kimura Parker gave justice to Rachmaninoff’s Piano Concerto No. 3, with a heart-pounding finale that moved the crowd to a standing ovation. After the intermission, Michael Torke had his World Premiere of Plans, an equally powerful work that highlighted the voices of lyric soprano, Jonita Lattimore and tenor Bryan Griffin. For a $4.50 per person train ride, it was certainly worth the trip. And much more. For the same ride, a visit to the venerable Art Institute of Chicago can be had. During summer, Thursdays and Fridays are for free from 5 to 9 pm. But more than the tag price, the opportunity to admire great works of art is priceless. My personal favorite is Seurat’s A Sunday on La Grande Jatte. Grant Wood’s American Gothic is also housed here, as well as Monets, Picassos and Giacomettis. Just a couple of weeks ago, the museum also opened its new Modern Wing, an architectural marvel by Renzo Piano. The building alone deserves so much admiration, with its very clean lines, its open and bright interiors, and its location that offers you a fresh and majestic view of the city. Willem de Kooning’s Excavation has found a home here, as well as Jackson Pollock’s The Key. Not to be missed is Charles Ray’s Hinoki sculpture, an enormous piece of a tree trunk, and Lucian Freud’s Sunny Morning. So far, I have visited twice, and this Friday I am coming back for more. On a summer like this, it’s hard not to fall in love with Chicago.